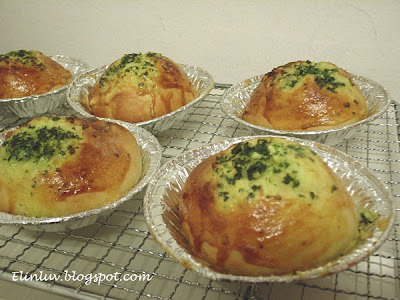 I baked some Garlic Buns for the youngster and Steamed Banana Cupcakes for the older generation..heehee needless to say, the later one was more popular with the young and old. 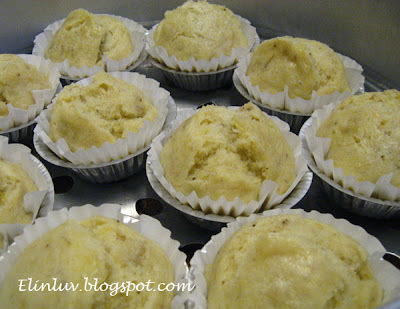 I got reviews that the Banana Cuppies were yummy…after the party ended many church friends were asking for the recipe (“,). A member whom I did not mix much became closer and at the end of our conversations , guess what , we enchanged recipes and another member even taught me how to prepare the ‘ Fried Tofu with Thai Chili Sauce ’ …haha what a wonderful and blessed 'Pot Bless Night ' and surprisingly I enjoyed myself so much that I am looking forward to another ‘ Pot Bless Night ’. Hah…now I know that many of our ladies are good cooks…..truly God’s Blessing! I regretted that I did not bring my cam with me otherwise I can display here the food that the others brought for the night. Lotz of nice home cooked dishes plus Roast Pork ( the most tasty roast pork I have eaten so far and home roast by the Birthday gal herself ) . I may have left out some dishes coz I was busy savoring and crapping with the members...the oo and the arr :))) Truly, the party was a success and the warm fellowship among the members further strenghten the relationship. I love the food and the warm friendship ...a wonderful gathering that will become fond memories for me. Food brings people together...how true!